A powerful calculator for common chemistry problems. Reimagined. Detailed listings of elemental data. Natural chemical syntax, including hydration. 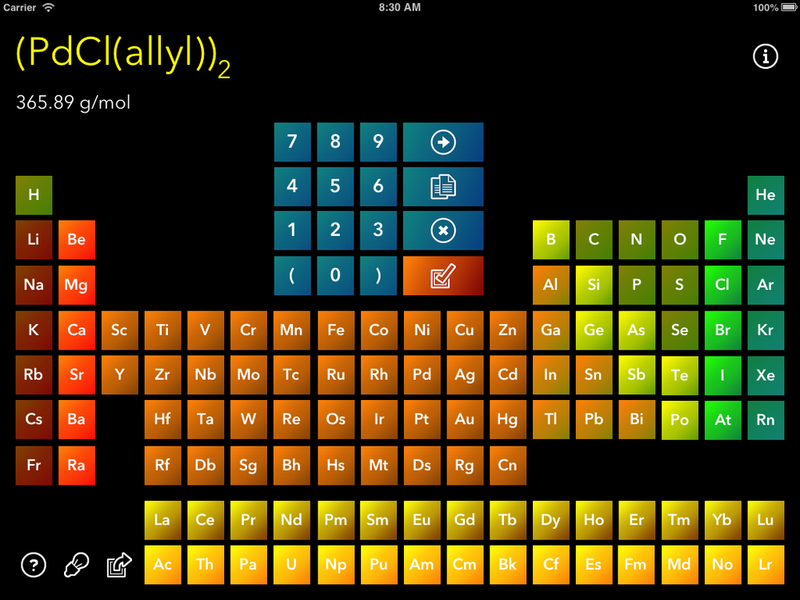 ChemTrix features a custom-built number pad and full-sized periodic table with large touch targets to make entering formulae quick and accurate. But it goes further than that. By default, ChemTrix dims the majority of the table, leaving only the most common (organic) elements (C, H, N, O, P, S, and Cl) highlighted. This makes it much easier to locate the elements you use most often. 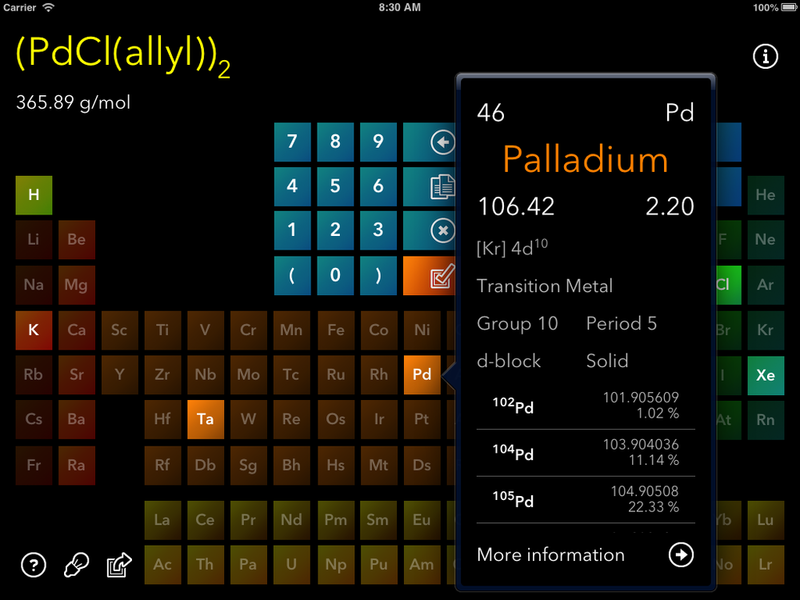 ChemTrix also remembers and highlights your five most recently entered elements, making them easier to find, too. If the dimmed table doesn't suit you, simply tap the light bulb icon to illuminate all elements. ChemTrix doesn't force you to live in a world of strict empirical formulae; it understands natural chemical syntax, including groups and nested parentheses. For example, enter C12H27P for tributylphosphine, or (Me(CH2)3)3P, or Bu3P – whichever you prefer. ChemTrix is pre-programmed with over thirty common organic groups ranging from simple alkyl and aryl subsituents like Me, Et, and Ph, to protecting groups, like MOM and BOC. It also knows over forty polyatomic ions. 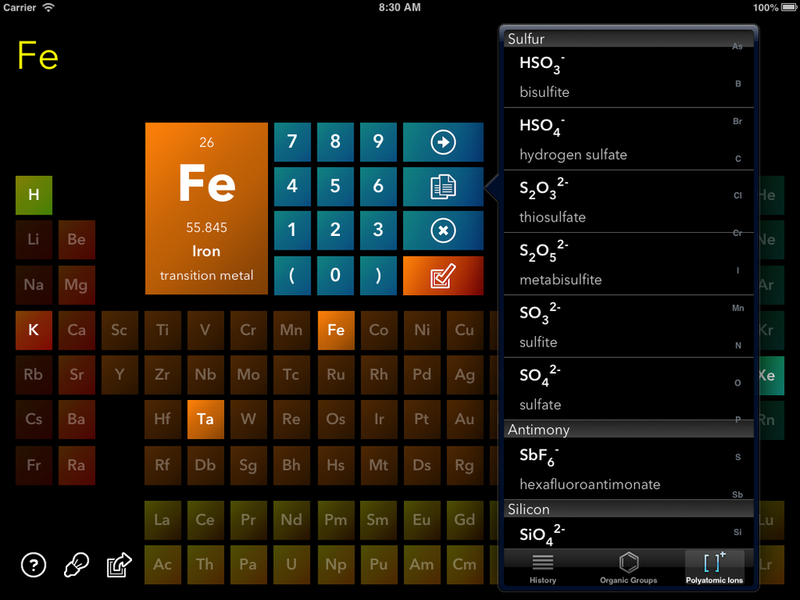 Simply tap the list button to pull up a table of known groups and ions. Tap any one of these to add it to your formula. After you've entered a formula, tap the info icon. ChemTrix will display the mass-moles-molar mass and moles-volume-concentration relationships associated with the current formula. The default quantity is 1 g of material dissolved to make a 1 L solution. You may change any of these quantities by tapping on the appropriate value and entering a new one; the dependent quantities will be calculated for you. You may also change any of the units by tapping them and selecting a new unit from a pop-up table. 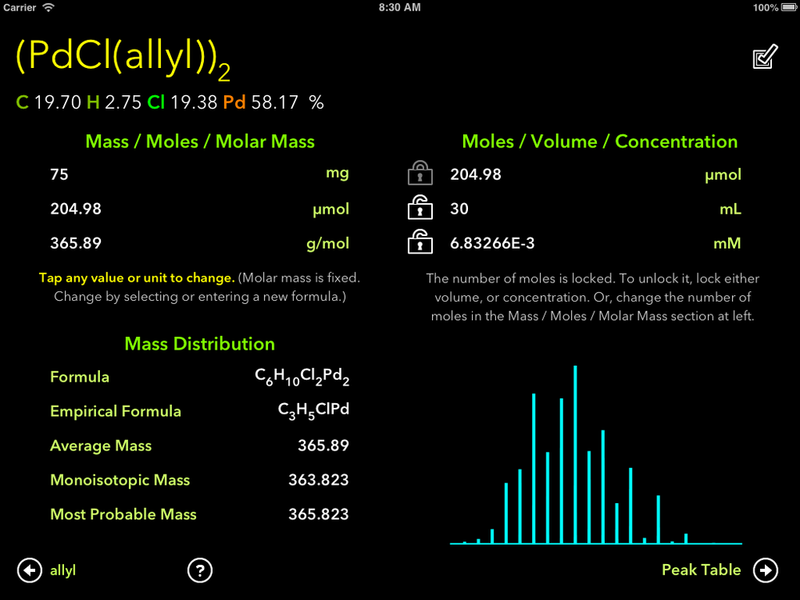 The info screen also shows mass distribution data for the current formula. It gives the average, monoisotopic (exact), and most probable masses together with an isotopic distribution pattern. Tap the Peak Table disclosure arrow to list the masses and relative magnitudes of all the peaks in the distribution. You can also cycle through all entered formulae without having to return to the calculator by tapping the forward and back buttons. Tapping the back button lists all formulae preceding the current one, while tapping the forward button lists all formulae following it. Select any formulae from these lists to see data associated with it. If there's anything about ChemTrix for iPad that doesn't work quite right, or as expected, please file a bug report with us and we'll fix it as soon as possible. If you'd like to suggest new features that would make ChemTrix better for you, get in touch. We're always happy to learn from our users.